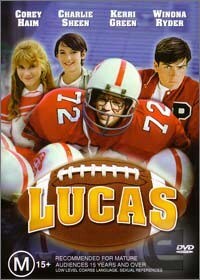 At 14 years old, Lucas is a bit too small for his age... and far too smart for his High School classmates. He's more interested in symphonies and science fairs than food fights and football. But when Lucas finds himself falling in love with a cheerleader, who only has eyes for the school's top jock, he grows desperate for her attention. Even if it means risking his pride - and his neck - at the big game! Starring Winona Ryder and Charlie Sheen before they really became big, this light hearted is another take on Revenge of the Nerds. When Lucas falls in love with the high school cheerleader, it's time to take on the jocks in this story that proves if you really want it, you really get it. It's cheesy clichéd at its best! Presented in an aspect ratio 16:9 widescreen with Dolby Digital 4.0 of the hit movie from 1986. No Extras whatsoever!